Choosing the best bird watching binoculars really comes down to individual preference. What's important to you may not be important to someone else. Below we will discuss how to choose birding binoculars and what features to look for and their definitions including magnification, objective lens size, close focus, weatherproofing, prism design and more. We all know that trying to spot a warbler flitting around in the conifers with binoculars is a bit more challenging than focusing on an elephant on an African safari! Needless to say, birders need more in a binocular than the average elephant-watcher. Having a good pair of binoculars may make the difference between identifying that life bird or not. So what are the best binoculars for bird watching? There are a lot of features these days on binoculars that need to be considered when making a purchase. Should I get 7x35, 8x42, 10x50? Should I choose Porro or Roof Prism? Do I need my binoculars to be Nitrogen-Purged? Fully Multi-Coated? ED, Extra-Low Dispersion? Field of View, Close Focus, Exit Pupil...Oh My! Lets start with some of the basics and what each means to ultimately choosing the best bird watching binoculars. We will further explain binocular magnification, objective lens diameter, exit pupil size, prism design, close focus, eye relief, field of view, lens coatings, weight, waterproofness and rubber armoring. Binoculars are categorized by a set of numbers such as: 7x35, 8x42, 10x50, etc. The first number is the magnification or how many times closer an object will appear than without magnification. So with the 7x35s, objects will appear 7 times closer, 10x50s, 10 times closer. For example, if you have an 8 power binocular and you are 80 feet away, the image will appear as though it is 10 feet away. Why Not Get The Highest Magnification? Most birders will choose a binocular with a magnification of 7, 8 or 10. But why wouldn't you want the highest magnification? Lower power binoculars will allow you to see more because of a wider field of view (FOV discussed later). Basically, the higher the magnification, the narrower the field of view. You can see more of what you looking at through 7x than 10x. You'll also have a better chance of spotting a bird & following it as it jumps around in the trees with 7x than 10x. Additionally, if you are watching flocks of birds, you will see more individuals in a 7x than 10x. Comparing 7x40 with 10x40s (same objective lens size), the 7x will also give you a brighter image because image brightness decreases with higher magnifications. This is especially helpful in low light conditions, i.e. owl watching, in dense forests, and at dusk & dawn. If you require anything above 10x, you should consider using spotting scopes because binoculars above that magnification power will be too difficult to hold steady. Or you can try a pair of high power binoculars with a binocular tripod adapter. If you plan on using one pair of binoculars for all your birding, 8x are a good compromise and is the choice of many birders. When it comes down to it, a 10x binocular, although offering slightly more detail, will not make the difference between you being able to identify a bird or not. So for the sake of price & comfort, you may want to choose a pair of 8x or 7x. It will provide you with the best value for your money as well. You should stay away from low-priced (< $100) 10x binoculars! You will be better off purchasing a $50 pair of 8x because typically flaws increase as magnification increases in cheaper models. 7x and 8x are better especially for beginners who may need a larger field of view to spot and follow active birds. More detail or brightness of image? Do you have shaky hands? Is it easy for you to spot birds through binoculars? Do you need a broad field of vision or small? If you can, borrow different kinds of binoculars to see what works best for you. The second number on the binoculars is the the diameter in millimeters of the objective lens (front, big, fat lens on far side). So 7x35s has a lens size of 35mm, 8x42, 42mm. This is where light enters your binoculars. So the bigger the lens, the greater its light gathering capacity & the brighter your bird will be - the better detailed field marks will be able to see & colors will be more brilliant. So why not have the biggest lens? Because bigger means bulkier & heavier. A 50mm lens is as big & heavy as you would want to go. Fine if you're sitting on your backyard lounger, bad for a week-long backpacking trip. Weight of binoculars is discussed in more detail later. When I was choosing my first pair of bird watching binoculars many years ago, I was told to get binoculars with an objective lens size 5 times greater than the magnification. So if you are choosing 8x bins, the objective lens size should be at least 40 (8x40), 10x bins should be 10x50, etc. However, optic quality has increased greatly over the years and now you don't necessarily have to follow that rule, at least for binoculars priced $200 and up. As a general guideline, choose a lens size between 30-50mm. Compact binoculars usually will have lens sizes below 30mm. Yes, they will be lightweight, but you lose light and handling comfort. So don't choose compact bins if it is going to be your only pair. The popular sizes for bird watching binoculars are 8x40s or 8x42s after comparing brightness, field of view, and weight with smaller & bigger binoculars. An objective lens size of 30mm is the smallest any birder would want to go. If you often use your bird watching binoculars for viewing owls and other birds in low light conditions (dense, dark woods or at dusk & dawn), then consider a bigger objectives lens. More light gathering means more detail when the light level drops, and therefore, more quality birding time when the birds are active. And keep this in mind too, a high quality 40mm lens will give you a better image overall, than a cheap 50mm lens. The exit pupil is the diameter of light in millimeters visible through the eyepiece. It is determined by dividing the objective lens diameter by the magnifying power. You can see this beam of light when you hold up your binoculars (eyepieces towards you). It appears as a tiny circle of light in each eyepiece. The circle of light is the magnified image as it exits the binoculars and enters your eye. The bigger the diameter, the better you'll see in dim light, up to the maximum diameter of the human pupil itself, generally between 4mm to 7mm, depending on age and available light. Obviously then, the larger the exit pupil, the more light gathering capacity, and the brighter your bird image will be. If the exit pupil size is near the same size of our pupil, it will be more difficult to find images. For example, in bright light when our pupils are contracted to 2-3mm, those compact 8x21 bins (exit pupil = 2.6) are going to be difficult to use because our eyes are going to have to be centered exactly over the exit pupil to find our bird. Trying to follow an arctic tern on a rocky boat with a pair of compacts will have you barking at the buoys in no time! The image will also appear darker and not as clear. For general purpose birding, choose a pair of binoculars with an exit pupil size of at least 4mm. If you do most of your birding in shaded conditions (thick forests), dim light (owling) or on boats, choose 5mm or more. Porro prism binoculars have a z-shaped optical path where the objective lenses are offset from the eyepieces, resulting in a wider set of binoculars. In roof prism binoculars, the prisms overlap closely and the objective lenses are approximately in line with the eyepieces. 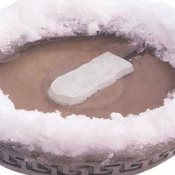 The result is a slim, streamlined shape. Because of the pricier technology required, roof prism binoculars are more expensive than porro prism binoculars. You can get an excellent pair of porro prism birding binoculars priced around $250. To get the equivalent optic quality in a pair of roof prism binoculars, you would have to pay around $400 and up. So if you're on a budget, porro prisms may be your best option. Remember though, that because porro prism binoculars are not as rugged and durable as roof prism binoculars, you may be better off in the long run with a roof prism if you can afford it. Close focus is the shortest distance at which the binocular is capable of providing a sharply focused image of an object. As a general rule, as magnification increases, the minimum close focal distance also increases. So yet another trade-off for you to consider: More magnification or shorter-distance close focus? Especially of interest to birders because there will be times when you will want to see the detail of a bird less than 15 or even 10 feet away. Therefore, a good birding binocular should have a minimum close focus of 15 feet, 10 feet would be better. If you like to view other creatures up close such as butterflies, reptiles, etc. close focus is also an advantage. A good pair of bird watching binoculars will allow you to get a quick & sharp focus of your bird. 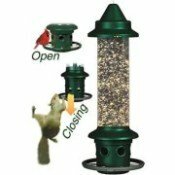 This is important in because many birds are constantly moving around and you will need to be able to focus quickly. A good focus mechanism will focus from close to far with one full revolution of the dial or less. You don't want to have to turn the knob too many times in order to bring a bird into focus. And make sure you get a pair of binoculars with a central focus that you can comfortably turn with your index finger. It should turn smoothly, without much effort. You will find that most birding binoculars do have central focus. Some models of binoculars have individual focus eyepieces which must be adjusted when looking at birds closer than about 30 feet, which is awkward and time consuming for bird watching. Again, you get what you pay for so you'll find that more expensive bird watching binoculars have finer-tuned focus mechanisms. Now go to Birding Binoculars Part II of how to choose bird watching binoculars which covers other binocular features, such as binocular eye relief, field of view, prism and lens coatings, prism glass types, rubber armor coating, and what to look for when purchasing a pair of binoculars. 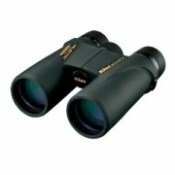 Or you may want to compare some of the best birding binoculars in each price range. One of our all-time favorite mid-priced binoculars for birding have been the Nikon Monarch 5 ATB 8x42 Binoculars (Review). Bushnell Legend Ultra HD 10x42 Binoculars - Another good choice in the mid-price range, especially if you want the 10x magnification. Best Birding Binoculars - Our picks in 3 price ranges. No More Binocular-Neck... Get a Harness!